When Harvard University English professor and dyed-in-the-wool romantic Gilbert Reedy is mysteriously murdered and thrown off his fourth-floor balcony, Lizzy and Diesel take up his 20-year quest for the Luxuria Stone, an ancient relic believed by some to be infused with the power of lust. Following clues contained in a cryptic 19th-century book of sonnets, Lizzy and Diesel tear through Boston catacombs, government buildings, and multimillion-dollar residences. On their way they’ll leave behind a trail of robbed graves, public disturbances, and general mayhem. Diesel’s black sheep cousin, Gerwulf Grimoire, also wants the Stone. His motives are far from pure, and what he plans on doing with the treasure, no one knows... but Lizzy Tucker fears she’s in his crosshairs. Never far and always watching, Grimoire has a growing, vested interest in the cupcake-baker-turned-finder-of-lost-things - as does another dangerous and dark opponent in the hunt, a devotee of lawlessness and chaos known only as Anarchy. I have been a big fan of the Stephanie Plum series for many years and I consider Lorelei King one of the finest narrators I've ever heard. I read Wicked Appetite in written form and enjoyed that very much so I was really looking forward to this book. Unfortunately I found it to be a disappointment. This book just doesn't have the fun and excitement of the Plum series or the first book in this series. Carl, (the monkey), was fun in the first book but seems somewhat slow and stupid in this one. Maybe because I read the first and listened to the second? Worth listening to anyway, if only because of the reader. I usually read epic fantasy, but for years now I have enjoyed diving into a Janet Evanovich book for some light, action packed fun. Her books are laugh-out-loud funny. I love Diesel in the "Between the Plums" books with Stephanie, and the first in this series was worth the listen (even if not quite as good as the Plum books). This one however, falls short. It never caught my attention and it took me weeks to listen to the whole thing because I kept switching to other things. The humor was not fresh, more like leftovers from the first book. And it seemed the book couldn't decide if Wolf was still the bad guy or not. Overall, I don't think I will continue with this series. I'll stick with Stephanie Plum. I like the narrater and enjoy the story. What did you love best about Wicked Business? What was one of the most memorable moments of Wicked Business? Would you recommend Wicked Business to your friends? Why or why not? Was Wicked Business worth the listening time? If you could sum up Wicked Business in three words, what would they be? Which character – as performed by Lorelei King – was your favorite? I just have to pick one? I loved them all. I love Lorelei King. She is by far my favorite narrator. You can easily tell which character is which which makes it easier to follow along. I love how funny this book was. Lorelei King does an excellent job narrating. I cannot wait for the third in this series! What made the experience of listening to Wicked Business the most enjoyable? The story moved along nicely and the characters were somewhat believable. This is Evanovich's style of story telling, you don't really get a lot of character development in this series. Lorelie does a great job with changing the inflection of her voice to represent the various characters. I am always looking forward to Janet E's books, and wait impatiently for the next book - this book DID NOT DISAPPOINT. Highly recommend this book. I had read the 1st one and was excited to get the 2nd one. The audible version sucked me in and had me laughing out loud. The author really can weave a fun, fast-paced story. Really, you know it's all going to work out in the end, but it keeps you on your toes thinking, "Wow, what next!" Gosh, I couldn't name just one. It's a fun read though. Hmmmm.....The dare to sleep naked, maybe Glow's spells on Hatchett, Anarchy with fire. Nope, can't pick just one. No, but I did take just a couple of days and listened to the book on my travels. Its good but not as good as they usually are. What does Lorelei King bring to the story that you wouldn’t experience if you just read the book? 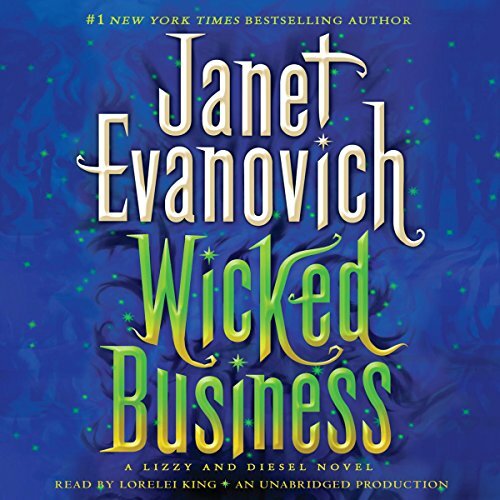 Do you think Wicked Business needs a follow-up book? Why or why not?